So… how adventurous are we today? Would “jazz-rock-fusion” tickle your musical fancy? 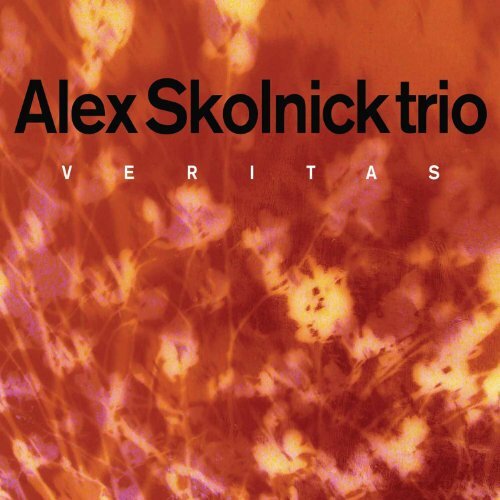 Because that’s what Alex Skolnick’s ‘Veritas’ is, and let me tell you, it is a treat for the senses, blending the vitality and power of rock with the mystic thrill of impassioned jazz. Opening track ‘Panna’ is a short, sweet, atmospheric track that has an almost meditative feel in its trembling guitar and smeary bass, as whispering percussive thrills clatter and hiss in the background. This leaps from a shimmering high-end guitar into the low frequency driven ‘Bollywood Jam’, where distorted guitar riffs that wouldn’t be out of place on one of the more innovative NWOBHM albums are given, indeed, a Bollywood flavour, as the drums flit between impersonating Indian instrumentation and full-on rocking out, with savage drumkit rolls, as the bassline slides tantalisingly beneath the layers of guitar melody that is both evocative and straight to the point. Midway through, the bassy atmosphere transforms into a frenzied high-pitched guitar solo, before the main bass riff kicks back, the drums joining with a renewed fury, and the whole track builds and builds its heat until the end with a jangling, growling intensity. ‘Song Of The Open Road’ is much more typically western jazz, albeit with a rock flavour, still the bass and guitar interplay spark off one another in a manner that brings to mind a down-to-earth AOR track with much less cheese, but the melody, and the skittering percussive element is jazz to the marrow of its bones. As full orchestration kicks in, the lilting, muted guitar, forwards bass/drum section, lush melody that easily replaces vocals and lyrics in terms of expression, and sense of freedom brings to mind the compositions of Stewart Copeland, with a pleasurably listenable take on jazz-influenced modern instrumentals that takes its cues from the five-minute rock song. Title track ‘Veritas’ is a similar and similarly brilliant affair, taking hints from heavy metal in its throbbing, stomping rhythm and tense guitar melody. The production job here is stellar: the drums cavernous, the treble crystalline, the low end seismic, the overall effects fascinating to behold. An emotional comedown soothes the nerves in the melancholy acoustic mastery of ‘Alone In Brooklyn’, as an almost classical melody is punctuated by ghostly harmonics that add dimension to what is a fully alive and breathing song. Hints of sombre strings add yet more, and the heartbeat percussion creates a tender atmosphere that really does evoke a solitary, introspective and ultimately beautiful track that goes between pop and maestro with practised ease. Possibly what will be the most well-known track here is a jazz take on Metallica’s iconic ‘Fade To Black’, a loving yet individual reworking of it, the squalls and bile replaced with warm, tuneful jazz and a luxuriant bittersweetness that still retains an intense heart thanks to tumbling, precise percussion. If you’re after full-on jazz, the funk-tinted jam ‘99/09’ may well be your best bet: complex rhythms are given full exercise as an energetic, cheeky jazz melody sparks around them, and the smirk and soul is evident throughout. Chase this up with ‘Path Of Least Resistance’, with its barely-there gliding guitar harmonics, cymbal-driven percussion, and tonal shifts that really set the scene. Employing some deft cello to offset the lyrical guitar and sleek yet pillowy bass, this is nine minutes of instrumental bliss. After the hushed chill of ‘Reflections’, closing track ‘The River Lethe’ gives us a smooth opening and a lively, fun finisher, with a sparkling, lively blues-funk veneer over the whole affair that works wonderfully with the musicians, allowing Alex Skolnick’s guitar to take the spotlight yet not overpower the clearly talented musicians, all of whom give it 100%. ‘Veritas’… it’s jazz, but not as we know it, and I for one could not be happier. Alex Skolnick and his band of incredibly talented musicians have created something that defies all known bounds of music to create a collection of incredibly evocative tracks that are undeniably listenable and above all thoroughly enjoyable across the board: an album so good, you can spend all Saturday morning indoors picking it apart and feel that it was time well-spent. Ben Howard is pleased to announce details of his debut album this Autumn.